Panic buying caused temporary food shortages in 1914 but the supply was not a problem until the end of 1916 when food prices began to rise. By October 1916 coal was also in short supply. Lord Devonport was appointed Food Controller in December 1916 and people were encouraged to reduce their consumption of certain foods. This was not very severe at first. Shopkeepers were not to “flaunt goods” in their window displays. Families were encouraged to have one meatless day a week. Bakers had to produce buns in a proscribed way. In 1917 things deteriorated rapidly as the Germans began “unrestricted submarine warfare”. This meant they were attacking civilian shipping in the Atlantic that was carrying food, largely wheat and sugar, from countries such as Canada and the USA. Each month the tonnage of shipping lost rose alarmingly and 400,000 tons of shipping was destroyed in the first half of April 1917 alone. Britain soon had only six weeks supply of wheat left. The Government’s policy appeared to be to avoid alarming the public. The mood seems to be summed up with a Times article of May 25th 1917 under the heading “cheerfulness with economy” which announced that there would be a “National Welfare and Economy Exhibition ” at County Hall in June with demonstrations of how to save bread and fuel and how to deal with waste paper. Other topics in the display would be marketing, co-operative housekeeping, economical clothing, boot repairing, home gardening and fruit and vegetable preserving”. Queen Alexandra would be attending, but not of course giving talks on any of these subjects. The Defence of the Realm Act empowered the government to take over land when it was deemed necessary and the government soon had 2.5 million acres for farming. Still the population were merely urged to avoid flour in pastry and to reduce their bread consumption by one quarter, although flour mills came under government control and beer production was limited. Pub opening times had already been reduced throughout the country and pubs were not allowed to open before 9am or after 10pm. These measures were not enough and malnutrition began to appear in poor areas. Rationing in the accepted sense was still not introduced until February 1918. Sugar was the first item to be rationed, quickly followed by butcher’s meat, cheese and margarine. Ration cards were introduced and people had to register with a butcher and a grocer. According to the Spartacus website rationing was to guarantee supplies rather than to reduce consumption and the success of the scheme was proved when official figures indicated that that the intake of calories almost kept up to the pre-war level. It was also very encouraging to see that the malnutrition that had been identified in the poorer areas was soon eradicated and no one actually starved. By the end of the war the government was controlling 94% of everything eaten and drunk in Great Britain. 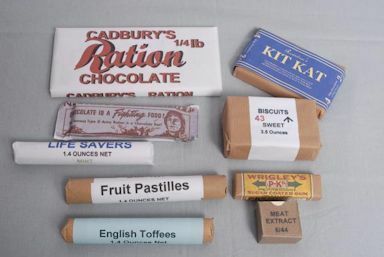 Although rationing in the accepted sense was not brought in until February 1918, even before that time there were controls on the way some foodstuffs could be used. We know from newspaper reports that at least three of Thornbury’s well respected trades people, Messrs Wilkins, Councells and Weatherheads were charged in December 1917 with misusing their sugar rations under the Sugar (Domestic Preserving Order) 1917. This law was introduced to ensure that there was enough sugar to preserve fruit etc to help feed the population throughout the year. Joseph Thomason the headmaster of the Council School was called up for war service in 1917. Samuel Dennis the headmaster of the National School (now St Mary’s) became head of both schools, based at Gillingstool. By the end of October 1917, it was reported that the schoolchildren were hard at work picking blackberries and over 41 cwt (more than two tons) of blackberries had been collected. In September over 9 cwt (almost half a ton) had been collected in just one week. 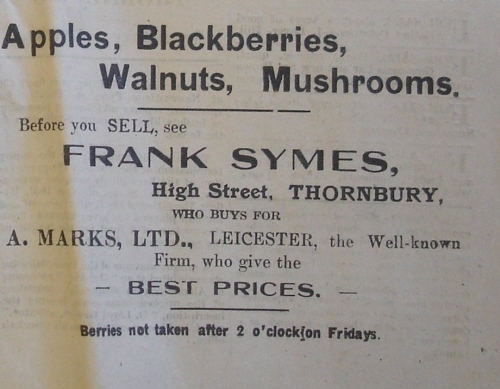 The berries were sent to a jam factory for the requirements of the army and the navy. Blackberrying was something of an obsession in the schools at this time. The records of St Mary’s school indicate that children were spending most of the school day gathering them on fine days during September and October 1918, although the managers were now beginning to believe that the infants should not be sent out. Food economy was both national issue and a local one. We learn from Tony Cherry’s research for his book “History of a School” that on 26th November 1917 the governors and the head of the Council School discussed the advisability of providing a hot mid day meal for the children (the National School had been doing this since 1895). Meals were indeed served in the Council School throughout the winter to 86 pupils but ceased on 16th May 1918. St Mary’s school records show that pupils were told they should have hot meals in school and not bring packed lunches to use less bread. 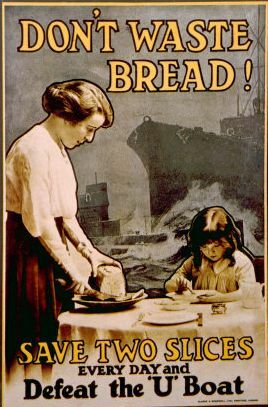 This idea to save bread seems to have come from a meeting of the Ladies Working Party led by Mrs Lloyd that took place earlier that month and began the Food Economy Campaign and a committee of that name. It is not easy to tell when the National School began “Digging for Victory” in World War I. As early as 1911 according to their book “150 Years of St Mary’s School” they began to garden in earnest, making “14 gardens and one nursery plot”. They were visited and praised by the County Gardening Inspector. By 1914 their efforts must have been making a difference to the families in the area as the School’s shopping list for seeds included – a quart of peas, a quart of broad beans, quarter pint of dwarf beans, half pint of runner beans, 1oz of beetroot seeds, a packet of cauliflower seeds, 2oz carrot seeds, half ounce of cabbage seeds, 2 packets of lettuce seeds, packet of leek seeds, 2 ounces of onion seeds, a packet of parsley seeds, an ounce of parsnip seeds, two ounces of radish seeds and two ounces of turnip seeds. Their potato crop that year was averaging thirteen and three quarter tons to the acre. Although St Mary’s School was closed in 1917 when Mr Thomason was called up and St Mary’s head Mr Dennis became head at the Council School, the redoubtable Samuel Dennis kept both school gardens going. The older boys were also able to help the war effort as they were allowed to help with milking on local farms. Other children left school early either to help with milking or to look after children while their mother did the milking. The children even found time to collect eggs to be sent to feed wounded soldiers. They sent 78 the first week, then 101 followed by a further 281 over the next few weeks of June. In August they collected 275. It is difficult to determine when the children were actually taught anything as they were also collecting waste paper for salvage and they sent more than 2 cwt of paper to Messrs Chamberlain Ltd of Nailsworth in December 1918. We know of at least one member of the Food Office staff in Thornbury at this time. In May 1918 Winifred Alice Underhill married William Henry Hill. Winifred was said in the report of her wedding to be well known in Thornbury because of her connection to the Food Office there. Despite the experiences of the Great War, at the outbreak of World War II Britain was not only continuing to import food but was now importing something in the order of fifty-five million tons. This time however the Government moved rather more quickly to deal with the issue of supplies once war was declared. Rationing was introduced on 8th January 1940. It was also decided to increase food production within the country and a “Dig for Victory” campaign was announced by the BBC on 10th September 1940. Petrol rationing was also introduced in 1941 and so people were encouraged to reduce their fuel consumption. According to George Ford in his book “Thornbury Pubs” “zoning regulations were then introduced for brewery supplies, stipulating that pubs had to take their beer from the nearest brewery to reduce transport costs. ” The beer drinkers of Thornbury could no longer have beer from Cheltenham and Stroud as Thornbury’s pubs had to use of one the two Bristol breweries, that is George’s or Bristol United Breweries. Desperate times indeed. Another and even more serious cause for concern was the water supply. The potential shortage of water was the subject of a letter from West Gloucestershire Water Company to all householders in the Thornbury area. Apparently the increasing demand meant there was no longer a margin for unexpected contingencies as supply was barely meeting demand. The letter explained that a bore hole 60 feet deep had been sunk “in a likely position” but that failed to yield a supply. A second bore hole had to be abandoned and a third bore was in progress but it was unlikely to yield a sufficient supply. The water company had promoted a bill in Parliament to obtain permission to use water from a river but this was refused. The company was legally required to meet the demands of the public for clean water but it seemed that there was no prospect of increasing the supply. People were asked to use less water. The average domestic consumption only ten years earlier was 13 3/4 gallons a day. By 1939 it had risen to 17 1/2 gallons a day and should the public reduce its consumption to the earlier level the difference would give the area nearly two years of extra supply. In comparison Offwat’s figures for 2007/8 was in the equivalent of roughly of 32.5 gallons per household. Thornbury’s school children and teachers were once again very active in the war effort and helping to improve the nation’s diet. According to Ray Worsley the Council School children picked rose-hips to make syrups rich in vitamin C and acorns (to feed pigs rather than people). The rose-hips were sold to Alfred Riddiford at Myrtle Cottage, Horseshoe Lane to be processed at Coleford in the Forest of Dean. He also bought the blackberries for two and a half pence a pound, unless it had been raining when Mr Riddiford declared that the blackberries were wet and only worth two pence a pound. The Education Authority wrote to the local schools that of the ten counties whose children picked rose-hips for the war effort Gloucestershire had produced the most. The considerable practice gained in the First World War must have paid off. Parties of children from the Grammar School also helped local farmers to plant potatoes. Despite all this effort there were still some shortages. The first foods to be rationed in 19 40 were bacon, sugar, tea and meat. Lots more foods were rationed later, including sweets. In 1941 one egg a week was the ration, but apparently that sometimes became one egg every two weeks. Many people never saw a banana at all during the war years. David Mawson recalls the first banana that he ever saw just after war ended. A classmate had gone home to lunch and was given a banana from a consignment that had been delivered to Bristol docks. The boy walked round the playground to show the other children what a banana looked like. Eventually he peeled the banana and ate it. His three best mates were given pieces of the peel which they ate!! We have been told that the bacon and ham ration was four ounces for each adult per week but you could have other meat to the value of one shilling and two pence. You were also allowed two ounces each of butter and cheese but you could have a generous four ounces each of margarine and cooking fat. Milk seems to be fairly generous at three pints each a week as does sugar at eight ounces. Preserves were rationed to one pound every two months. Our national drink – tea – was limited to two ounces a week. We have been told that in Thornbury the ration books were issued by Hubert and Edna Fudge from the office at their home at 4 Castle Street. We also have a note that Oriel House (the then Council Offices at 8 Castle Street) was used as a Ration Office and that Beatrice Gibbins and Gwendoline Mills worked there. As rationing went on for so long it is not unlikely that both versions were true. Pat Pearce nee Sainsbury worked at the Food Office, then part of the Ministry of Food at Oriel House. The executive officer there was Reg Millard who was also a Councillor. 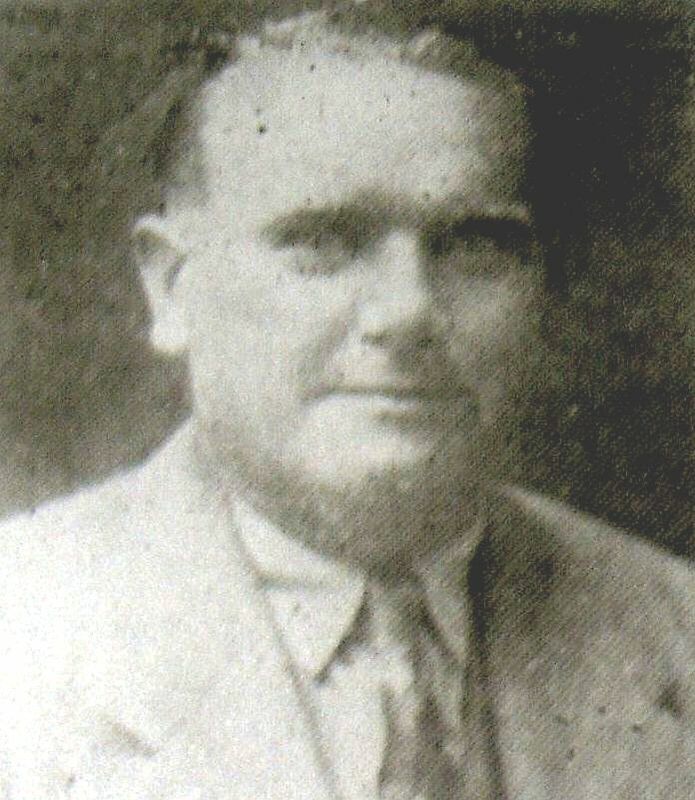 We have a rather poor quality photograph of Mr Millard taken from a newspaper article of 1945 when Mr Millard was awarded for public service in South Gloucestershire. The article says that he was not only Executive Officer of the Food Control Committee but Deputy ARP Sub-Controller as well as his actual profession which was Engineer to the South Gloucestershire Internal Drainage Board. Shopkeepers, as in WWI, were expected to show restraint in their window displays – even if they happened to have goods to sell. Some locals can remember a time when William Wall’s sweet shop on Pullins Green had displays of flowers in the window rather than sweets. Because of the restrictions on packaging and inks sweets, like other products, also lost their attractive wrappers and display material. We have here above on the left above an example from the National Education Network website. The shortage of sweets seems to have driven the children to desperate measures. Ray Worsley recalls that ‘when the jungle drums spread word that an American Hospital train had arrived every boy would immediately bike up to the station walk down the embankment and holler to the troops “have you got any gum chum?” The soldiers would then throw gum out of the train windows.’ The shortages did make the children grateful for sweets when they got them. Henry Smith can remember that when the sweet ration went from two ounces to four ounces he spent time day dreaming about what he could have. People managed to work round the restrictions in their own ways. Henry Smith tells us that he had a job helping on a bread round. The baker hated all the bureaucracy. One day Henry found to his great dismay that he had lost some of the ration coupons he had been given. The baker replied cheerfully ‘That’s alright I have got a few spares!’ Henry also gave us an example of the bartering that went on. His mother knew a vegetarian and so traded the family’s cheese rations for the lady’s meat ration. The country was forced to become well acquainted with rationing. The sweet rationing ended in February 1953 but the meat and bacon rationing continued until 4th July 1954 – more than 14 years after it was introduced.